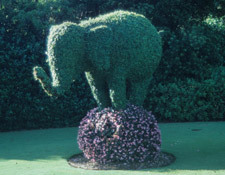 Topiary is a specialized style of gardening. 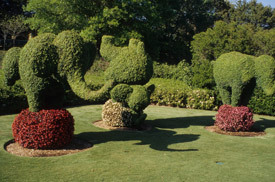 Topiary is often seen as individual evergreen or deciduous plants that are clipped and trained to geometric or fanciful figures. It is the ultimate in garden whimsy. In the container gardening world, topiary are often wire frame, filed with sphagnum moss and then planted to resemble any number of geometric forms or even animals. While topiary are interesting and fun garden additions, they do require a fair amount of maintenance in order to have them develop their full potential. 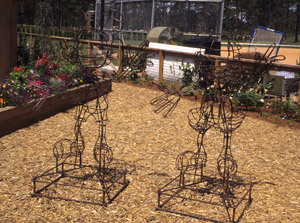 Most topiary start out as wire frames. These frames come in all sizes and shapes imaginable. From small dogs and cats to larger than life exotic animals such as a giraffe or elephant, to a whole host of geometric forms. Once a form is chosen the frames are packed with moist sphagnum moss. The moss is the media that the plants grow in while the frame is the "container." Once the frame is filled with moss the planting process can begin. The plants often chosen are those that are of a spreading habit and root along the stem. However, many other types of plants are chosen depending on the type of figure chosen. The selection is usually based on trying to recreate the illusion of fur or feathers especially when animal forms are being planted. There are also plants chosen for their ability to portray a certain type of ornamentation. What you eventually try to create is a mosaic using plants of different colors and textures that look like a real figure. In making choices, it is helpful to visit garden centers to view their inventory of plant material and then visualize how it might translate into what you are trying to create. Check the list at the bottom of the page. These suggestions will help to get you started. It is a good idea to choose plants grown in small pots or to use "liners" or cuttings. They are easier to plant and more economical. Once planted the topiary needs to be thoroughly watered. After that, your creation will not demand close attention to watering and fertilizing. These figures dry out quickly and need to be watered on a timely basis if they are to fill out as you expect. Always feel the moss for moisture and try to water before it gets dry. Water slowly so the moss soaks up moisture evenly. Fertilizing every two weeks with liquid fertilizer will help maintain quality. The next challenge is what to do with the form at the end of the season. 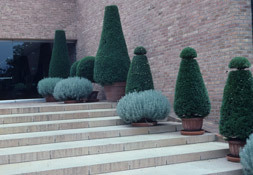 Unless you are living in a warm climate, topiary will need to be brought in for the winter. Many of the plants used are not reliably hardy plus being in a very exposed growing condition even hardy plants will find it difficult to survive. The best place for most topiary is in a greenhouse or conservatory. Without such a location they could be brought indoors and placed in a sunny, cool location. In most home situations, they are subject to rapid drying so watering needs to be done on a very timely basis. Taking it to a sink or bath tub where water can be applied freely and then placed back in the sunny location after it drains is the ideal. Occasional trimming of plants may be needed to keep each plant in bounds, and maintain the look you intend. Hen & Chicks Sempervirum sp.